Every May and June it’s the same: hordes of fresh-faced, terrified graduates are unleashed upon the workforce, caught between trying to find a job – any job – and trying to land a career that allows them to express the best of themselves. If you’re in this situation – whether you’re a new graduate or someone just trying to make a career change – here are a few things you can think about when finding the right career for you. Many people choose their jobs because they believe in what the job is trying to do. They think that the “why” of the job is the most important part. And I’m not saying that it’s not important – it’s just not the most important. The most important part of any job you take is actually the “what.” What are you doing at 10 o’clock on a Monday morning? What are you doing at 3 o’clock on a regular Thursday afternoon? 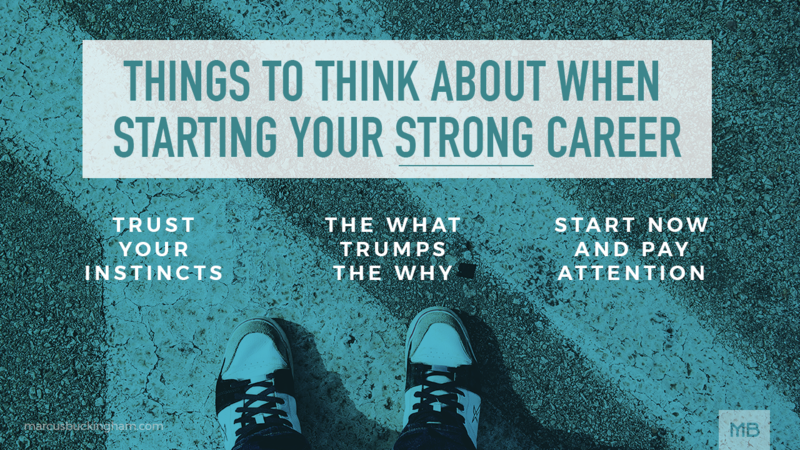 While you might choose a job for the “why,” how long you stay in that job, how fulfilled you are, and how effective you are in it depends on the “what.” So if you’re considering a certain career, go talk to someone who is already doing it and ask them what they do during a regular week. If their answer doesn’t excite you, it’s probably not the right career for you. Don’t put pressure on yourself to find that perfect job, especially right out of the gate. All you can do you is start, see what life can teach you in the context of that job, and then use that intelligence to pick the next one, and the next one, and the next one. I am curious about your outlook on 360 evaluations. I recently completed one on a colleague. Im not sure what the desired outcome is targeting or what the value actually is. If you were to design a similar product what would it look like, what questions would you include. He’s written extensively about that elsewhere, and even designed a whole product (StandOut) that addresses that. Of all the questions you could ask, you could seriously do some more research before asking ones that are so easily answerable. I don’t mean that as a slight, it’s just such a wasted opportunity to ask already answered questions, when you could ask a new question. Wise advise as the most interesting career journeys are ones with curves. I’ll add “Chose your partner wisely” because people leak a lot of time, energy and their futures in go-nowhere relationships in the early career years. Everything you work so hard for can be undone and lost if your relationship doesn’t work for the long haul.